shelly's summary: Here we GROW again! 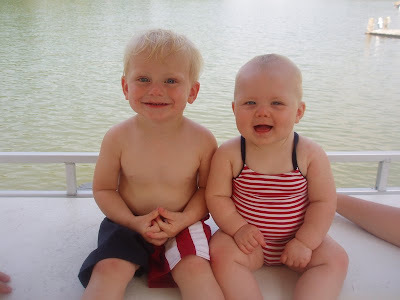 These pictures are taken every 4th of july on the back of the pontoon boat ... it is now a tradition... it is the first thing we do every 4th! What changes do you notice through the years? I think the biggest thing I notice most is Brylee's hair... she goes from having hardly any to tons and my family always talks about how dark brylee's hair is getting but if you look at these pictures her hair has never been as blond as jackson's no matter what age his is always blonder? I also think my favorite age is 3 for jp and 2 1/2 for bp... they both look so dang cute at those ages... i could eat their little faces up with their precious little smiles! When i look at these pictures... i really see why we get the "are they twins?" question ALL the time! OK, REALLY?!?! Where do you get their swimsuits so they match every year (I mean JP has the SAME suit and BP has the SAME suit)? It's a precious idea!! !